Convertibles, hybrids, SUV’s, new concept cars… and food trucks? 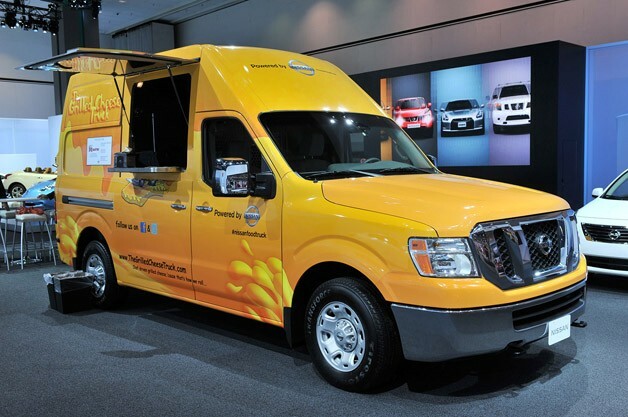 Nissan just unveiled the brand new Nissan NV van, sponsoring food trucks in Los Angeles with a fresh new design. The truck comes in three different models, and is the first commercial vehicle to be sold by Nissan in the United States. This news is monumental to food trucks, and some have already begun to use this new model. The Grilled Cheese Truck and CoolHaus LA gave out samples in NV vans, showcasing the new design over the traditional aged look most food trucks have. Standard trucks tend to be large and bulky, many being refurbished postal trucks, and they often have difficulty fitting into small spaces. The new Nissan vans are smaller with a lower height, and more compact to ease parking difficulties in cities. Venues often limit the number of food trucks to be permitted, but this new Nissan van may change the limits on food trucks at many of these events, and allow them to reach previously inaccessible spaces. Nissan food trucks also offer the advantage of better power and mileage than existing food truck models. The old trucks are often hard to find maintenance for, but Nissan dealers should be able to take care of all truck repairs. These trucks may also help to consolidate branding among several trucks with operations throughout the country. This consistency will help legitimize the branding of trucks such as Coolhaus, giving them some added legitimacy. The three Nissan NV models were released this summer in the United States. Nissan’s director of product planning, Mark Perry, said “It’s a unique product for us. This is really all about innovation, to have a little fun, because there’s been really nothing for this industry.” Until now mobile vendors have had few options, all with older technology. The NV comes with diverse features and available upgrades, and includes an outfitting service that will build and install up to 60 square feet of graphics on the vehicle, designed by the buyer. The model itself it sleek and futuristic looking in comparison to the older models, and proves that the food truck industry is here to stay. The rise of the ‘gourmet’ food truck has helped these mobile vendors increase in popularity recently. According to the LA Times, Americans are expected to spend $630 million at mobile vendors this year, up from $608 million in 2010.